Lutron light control systems are installed in almost every country around the world, and regardless of where your job is, Lutron delivers the same superior service and support. 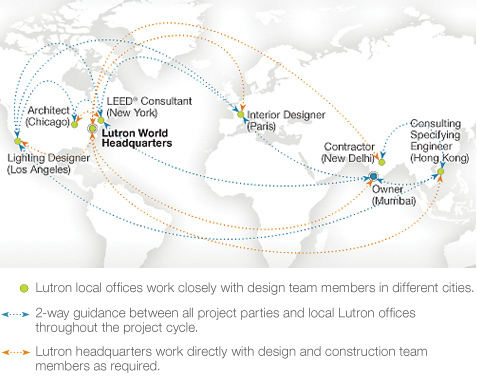 The Lutron GPS team supports you through the entire project process — from concept development to start-up —providing information and experience where and when you need it. Lutron also provides support for more than 20 global languages and dialects. From years of experience with global projects, we understand that no two projects share exactly the same process. That’s why the Lutron GPS team is available to help coordinate the project whenever and wherever it is necessary. Our goal is to achieve the result you envision for your client.